Grand Hotel is famous because Great Garbo said, "I want to be alone." I think it's a rather ridiculous reason for a movie to be well-known, but there you have it. Greta Garbo and John Barrymore, playing a coddled, insecure ballerina and a financially-desperate aristocrat, respectively, have top billing, but Joan Crawford and Lionel Barrymore steal the show. Lionel Barrymore plays an accountant at a large textile firm (run by Wallace Beery's character) who has been told he doesn't have long to live, so he's decided to really enjoy life for once and live it up at Berlin's Grand Hotel. While staying at the luxury hotel, he meets stenographer Joan Crawford, who neither refuses the attentions of John Barrymore nor those of Wallace Beery. Dramatic situations ensue--burglary, murder, lots of moroseness on Greta Garbo's part. It actually is entertaining and it's oh-so-stylish. Those sets! Those clothes! Bottom line? It's a classic pre-code melodrama. It's an Oscar-winner for Best Picture. You should at least see it once. You might even like it! Grand Hotel is available on DVD. 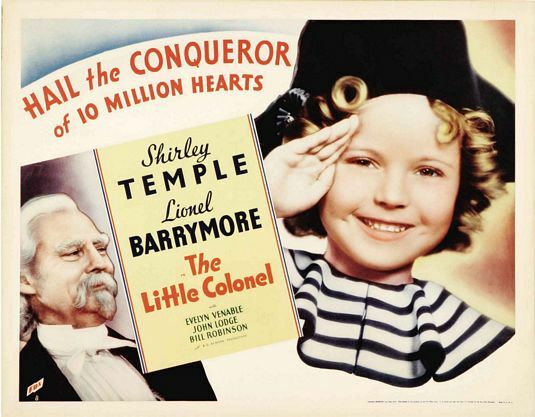 I was originally just going to review The Little Colonel, also starring Lionel Barrymore and (groan) Shirley Temple, because it came out in February 1935 and I wanted something to go with my Modern Meal Maker menu. I can't believe I made it through the whole thing. Lionel Barrymore spent the whole time doing a Colonel Sanders impersonation and Shirley Temple spent the whole time pouting (naturally). Hattie McDaniel and Bill "Bojangles" Robinson are the best part of the whole film, but the film is so amazingly racist it's hard to enjoy without recoiling in horror at some of the dialogue and the situations. It reminded me of a book we had to read in Historical Methods about how Southern writers, politicians and other influential Southern sympathizers were able to control the message over the Civil War by insisting that all the slaves were so happy. As backward as the whole film is, it was considered progressive at the time because Shirley Temple and Bill Robinson were the first interracial dance "couple." The staircase scene was edited out when the film was shown in Southern states. The Little Colonel is available on DVD. If I do say so myself, this menu was a winner. The original fish recipe was "Curried Sole" and I don't like curry powder and I had cod, not sole, so I used the ginger and oil from the original recipe and replaced the curry powder with some of my favorite spices. Feel free to play around with whatever combination you like and whatever proportions you like. If you want to use curry powder, substitute it for the cumin and coriander. This was easy and the whole thing only took 20 minutes (which was how long the rice cooked). The menu rather reminds me of Furr's, but in a fabulous way. Thanks for the film suggestions! Well, I guess you're not exactly suggesting we rush out to rent The Little Colonel. But I think that the film is worth watching just for the staircase dance! Very nice menu and I really appreciate your take on the movie. Its funny--I loved Shirley Temple movies (including this one) when I was little--what did I know? As an adult, of course, I see the movies differently. I don't think I've ever been able to sit through an entire Shirley Temple movie, and I have tried. So kudos to you, Lauren, for sticking it out! I liked Shirley Temple as a kid, but I think I'll steer any future children toward family films I still enjoy now, if at all possible! TJB- yes, practically everything is "in cream." I'm going to be making béchamel sauce in my sleep! All that fat just makes vegetables so darn tasty! must try your suggested films and dinner menu! Happy friday! I saw Grand Hotel at the theatre and really liked it, I would love to see the film. Also, your recipe posts always make me so hungry! The stairway scene is awesome! Don't think I've ever seen a Shirley Temple movie in its entirety. It's amazing that such a pretty meal only took 20 minutes!